Bible verses are an important part of my life. I lean on them when I’m going through the bad times and I revel in them when I’m going through the good times. I started this website because I have been through a lot of tough times in my life as well as a lot of good times and I want to be able to share the scriptures that I have leaned on to make it through in the tough times as well as the ones that I’ve used to praise God in the good times. Sometimes it seems like everything is going bad and your life is imploding around you. Sometimes you just don’t feel like you can take it anymore. Other times you can feel gods love wrap around you right when you need it. We all go through things like disease, divorce, abuse, job loss, etc. We also get to experience wonderful things like children, family, nature, spouses and lots of other things that God has made so good. This website is here for you to enjoy whether you are going through hell or you are in heaven on earth. 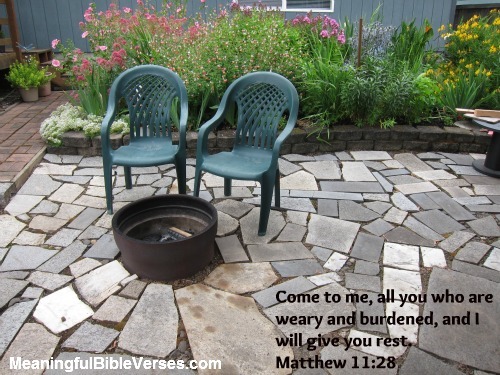 The Bible verses I have chosen to include in this website are the ones that are meaningful to me as I have gone through the various stages of my life. I’ve also written about many of them and you can read each of my thoughts about them by clicking each one. These are not meant to be theological, they are simply thoughts from someone trying to live a good christian life. I enjoy learning the meaning of the verses as well as the context in which they were written. I find that it helps me understand them and their meaning better. As I learn more about each of them I will share it with you. This website is not meant to be a place for theological arguments but rather a place for people to come and find encouragement through meaningful bible verses. The thoughts that I write about each of them are not meant to be critical of any religion, race or gender. They are simply the way I see things. I would love to hear your thoughts and comments and I have created comments forms so you can write your thoughts as well. Please let me know if you have Bible verses that you have found meaningful and/or encouraging and you would like me to add them. Thanks for visiting and I hope you enjoy this website!